May | 2014 | Extollagy! Three tawny owls chatter to each other with fledgling insistence, the calls bouncing from branch to branch, as if continually checking each other are ok, or saying hello, then forgetting they said hello and saying it again. Above them, but not very far above them, helicopters make practice night flights low over the woodland. Moonlight, low and full, twists perception: bluebells are rendered invisible; a shrub low across the path becomes a physical barrier; a great pool of brightness is merely a slight gap in the forest cover. Paths are clear: you could go for a long walk in this strange, tingly, silvery lightfall. 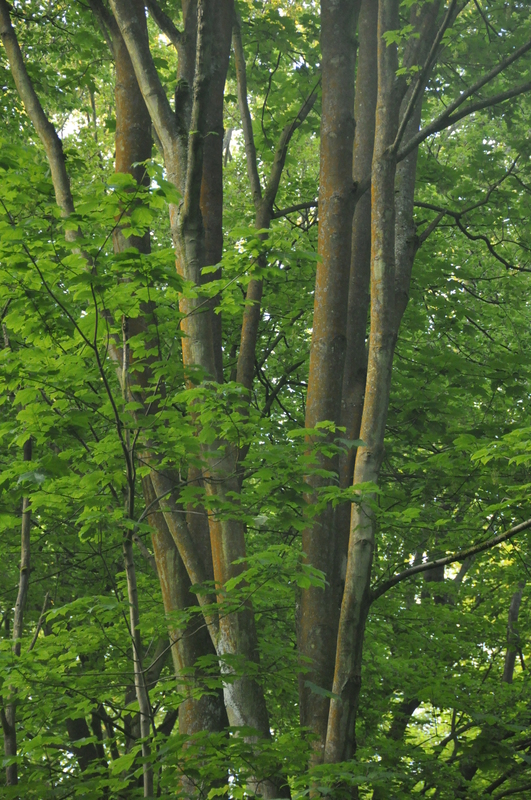 Wansdyke makes a spotlit linear opening in the trees; the stars that shine through this are close, cold, mineral-hard. I reach out and stick one in my bivvy bag, and spend the night wishing it would warm my toes up. It seems unfair to chuck it out: Betelgeuse eaten by midges and deer tics. Between two overgrown wheel-ruts I make a perfect bed, dry, soft, supportive. 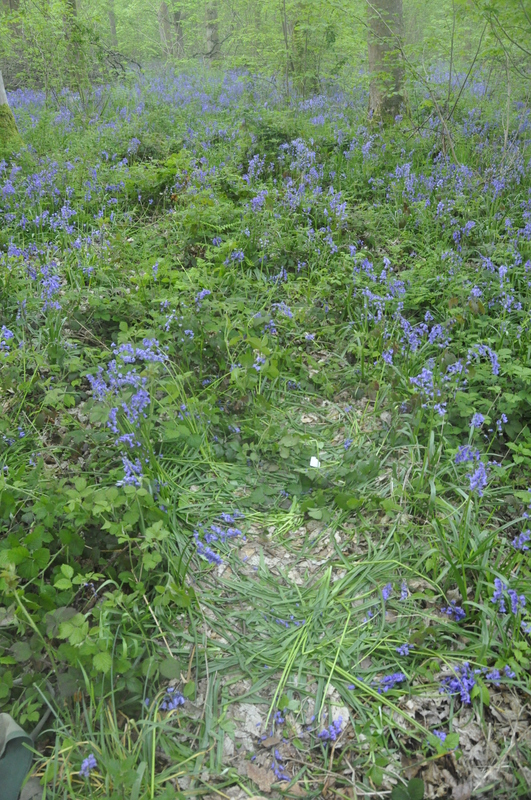 Whether it be the crushed bluebells and nettles, the thin soil, the ceramic quality of the clay-with-flints, or the light, friable depths of chalk beneath, the ground seems curiously light, like a mattress. In the depths of the night the helicopters return, their chopping blades scything the air and making an answering echo from the forest floor. It’s as if a freight train is slamming towards as a metal beast descends from above. Fugitives scatter between trees in frozen woods; orange poisonous fire vapourizes Asian villages. A six-foot black horse is hunting for us through the trees; it is ridden by a tall blond man with a frightening long-spiked Mohican. The helicopter circled for hours, but it seems I only slept for five minutes. Then I went for a walk, and found a café open among the trees: coffees, biscuits, a friendly café-lady. I realise the whole wood is full of people unicyling, cycling, running: it’s always like this at night, she says; people just don’t have time or space to practise during daylight hours. That was another five minutes of sleep that might have been two hours of fully lived reality: then, finally deep cold oblivion closes in. I’m surprised, as dawn sparks the chirping of the birds, at how quickly, long before the sun is visible, the air begins to warm. 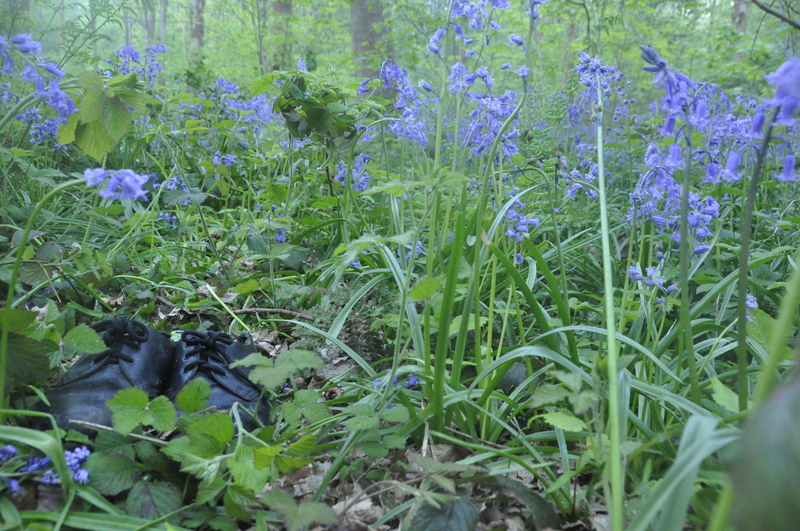 Bluebells, Wild Garlic, my Doc Martins and Nikon blur from smudges to hard volumes and swaying stems. The birds are no louder here than at home; no deer come and lick my face; the air is not rich with the scent of the flowers, not could it be until there is some real heat. I realise the wildlife wants to be on the forest cover, not down here in the dark below. There’s just us, the blue-smeared undergrowth, and the bivvy bag, which has left a flattened temporary archaeology of my passing the night among them all.